Yesssss I need a 10" Krang. This is my favorite thread. <3 Need more tmnt! Slash, 6" or 10" Krang, Metalhead, and Mondo Gecko are on the top of my list for the next wave. I could see these coming out in a few years with the release of the new movie or Funko store release. Tusken wrote: What about a Krang that is 10 inches to join the turtles? krang was the man back in the cartoon!!! I just need a metallic shredder and I'll be happy and done. I was more of a Mikey or Kasey fan. A 10" of Kraang would be soooooo sweet!! I think if they expand on any of the line Krang in a 6'' or 10'' form is a must for villains. I am not really sure who else I would like to see added to this line and I really don't want to see 50 more variants of the turtles or foot clan ninjas. I want new characters! Simple as that. Hauckbuster007 wrote: I think if they expand on any of the line Krang in a 6'' or 10'' form is a must for villains. I am not really sure who else I would like to see added to this line and I really don't want to see 50 more variants of the turtles or foot clan ninjas. Maybe that can be the Funko moment for the Turtles. I would love for a Casey Jones vs TMNT moment or a TMNT movie moment. Ah, the Casey Jones/TMNT moment would be cool to see! hailmary25 wrote: I just need a metallic shredder and I'll be happy and done. I would love to see a slash pop. It’s not one I think many want but I would like to see that one. They did the turtles for SDCC all those years ago it seems that with their craze of chrome and metallic they would have done it. I picked up my NECA turtles today from GameStop and it made me want more Pops Come on Funko we neeeeed em! CaseyJones14 wrote: I picked up my NECA turtles today from GameStop and it made me want more Pops Come on Funko we neeeeed em! Nice man, glad yours didn't get canceled! I would love for a classic Metalhead to be made! 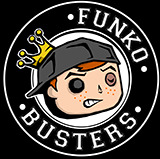 Cmon Funko we need a new wave this year! Bring out Krang in a 10 inch!! rexflexall wrote: Bring out Krang in a 10 inch!! Yes! This needs to be done.